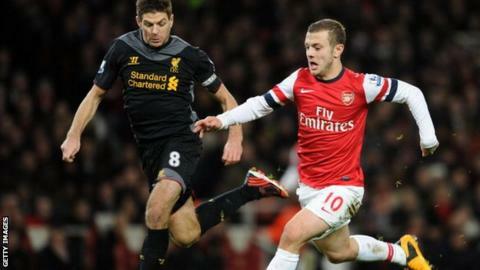 England captain Steven Gerrard has said Arsenal midfielder Jack Wilshere has the "potential to become one of the best in the world". The 21-year-old is expected to make his first England start for 17 months in the friendly with Brazil at Wembley. "He can tick almost every box, and he's going to get better and better. He'll get better than he is now which is a scary thought," said Gerrard. But the skipper warned: "One man can't carry a nation on his own." Wilshere made his international debut just under two and a half years ago, but will win only his seventh cap if he features against Brazil on Wednesday night. Jack Wilshere was eight years old when Steven Gerrard made his England debut against Ukraine in 2000. The midfielder, who returned to the Arsenal first team last October after 15 months out injured, has played just 324 minutes of international football and only 13 of them in the company of Gerrard. Gerrard, however, hoped the youngster would "bring out the best in all of us". "Jack has got a bit of everything," said the 32-year-old Liverpool midfielder. "He can tackle, get up and down the pitch, create a goal, score a goal, he can pass. "I think he's got the potential to become one of the best in the world and I don't want to add any pressure. That's unfair. "But playing against him recently and in training, he's a one-off. He's a lot better than your normal Premier League midfielder. I have a lot of confidence in him. "He's a top player and I hope he gives the dressing room a lift. We need competition for places if we're going to get to Brazil."